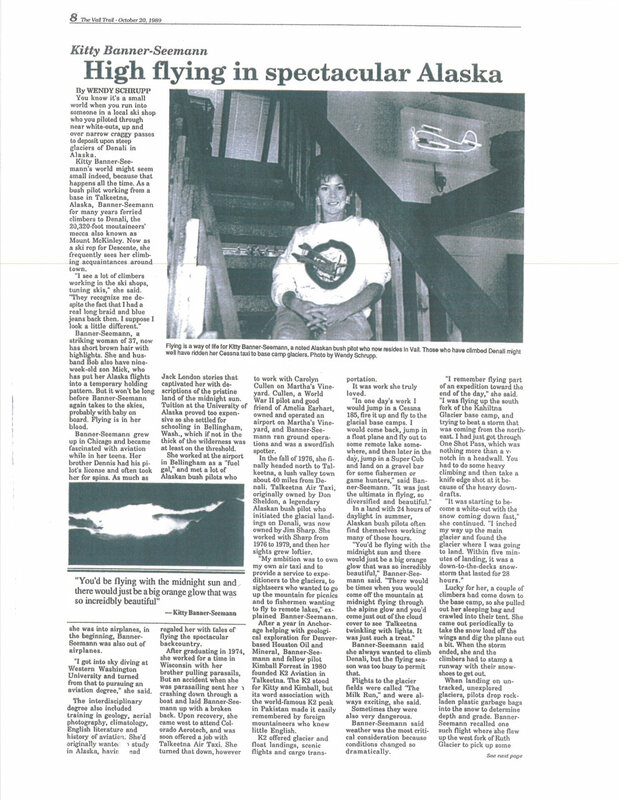 The articles, ads, books and letters on this page are a small glimpse into the accomplishments of Kitty Banner. Click on the arrows found on the left and right edges of each entry to read about Kitty's adventures and time in the air. TALKEETNA, AK—Jan. 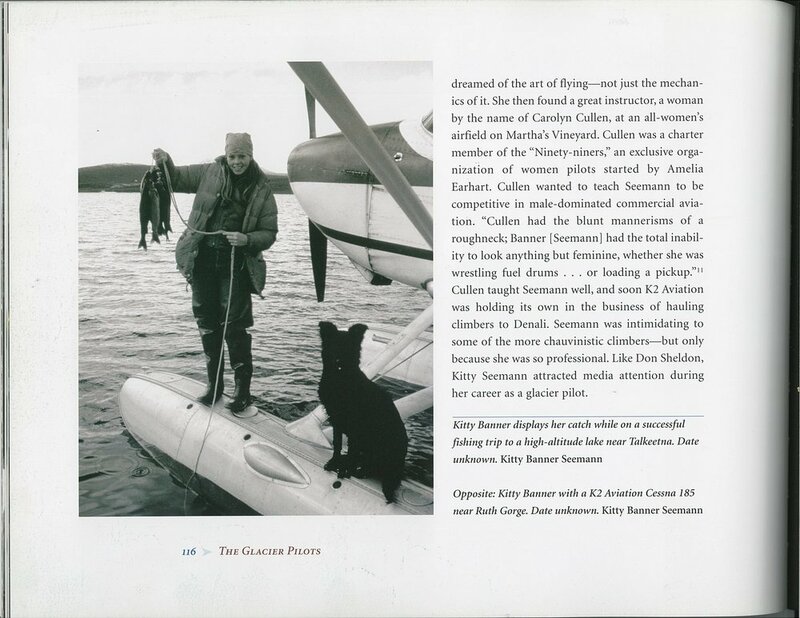 17, 2017—Kitty Banner Seemann, once an Alaskan-based glacier and bush pilot renowned for piloting climbers, explorers, adventurers and fisherman into the wilds and bush of Alaska in the 1970s and 80s recently released a narrative with 240 full-color photographs detailing her experiences. Wings of Her Dreams is available now on Amazon and in book stores nationwide. The book is a description of, and reflection on, Banner Seemann’s adventures in Alaska. 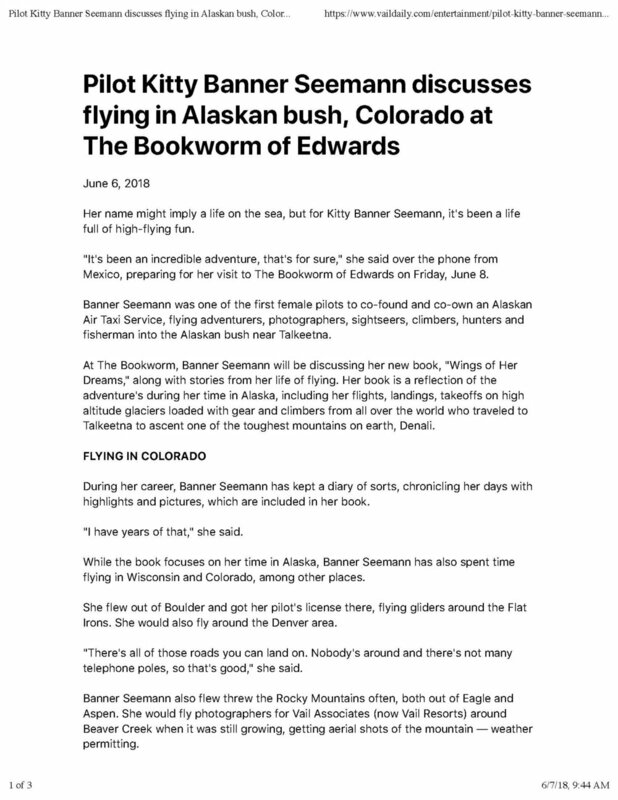 Readers can experience her flights, landings and takeoffs on high altitude glaciers, transporting mountain climbers from around the world who came to Talkeetna, Alaska seeking to ascend Denali (formerly known as Mt. McKinley), one of toughest mountains on earth. In Wings of Her Dreams, Banner Seemann tells personal tales of her time in the pioneer town of Talkeetna and its environs. Born and raised on the North Shore of Chicago, aviation was in her blood as her siblings made the industry their career and drew her to it at an early age. The story starts with Banner Seemann in her early 20s and carries through present day depicting a life of adventures and journeys from Talkeetna to raising a family in the resort town of Vail, Colo. where she, her husband Bob, and sons Mick and Corey all developed a similar love for aviation and “air” in all its forms as skiers, pilots and adventurers. In this time when audacious and fearless women role models are even more important, Banner Seemann’s story will inspire women and men alike to strive for the clouds and make the most of every challenge, trial, tribulation and goal. 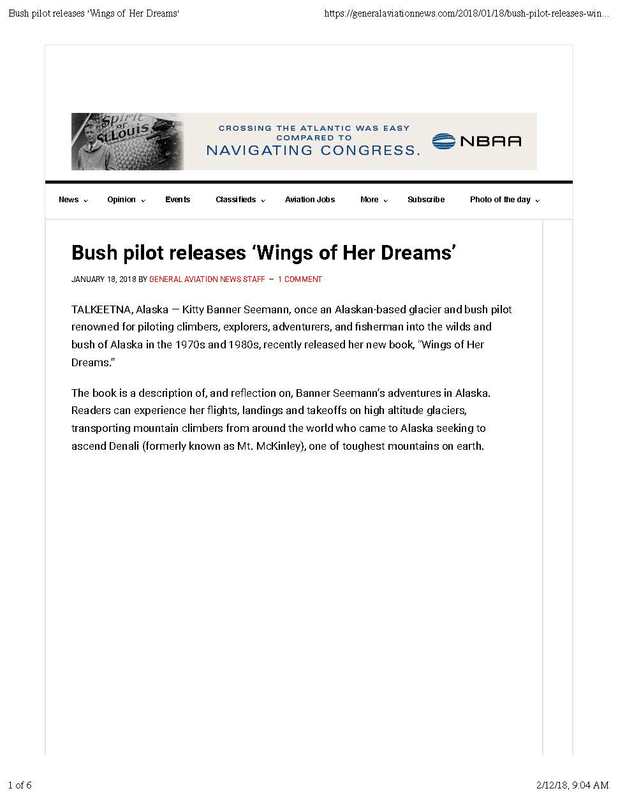 Written by acclaimed aviation-author Ann Lewis Cooper, in conjunction with Kitty and Bob Seemann, a legendary career-long ski coach, ski goods representative and pilot, the book is on sale directly through www.kittybanner.com, your local book source, Amazon.com, or by calling Pogo Press at 1-800-846-7027. Pogo Press was founded in 1986 to publish books concerning the arts, history, popular culture, and travel and became an imprint of Finney Company in 2006. Established in 1947, Finney Company currently has more than 400 proprietary publications and distributes more than 5,000 quality products, enhancing the company’s mission to help improve the quality of lifelong learning worldwide. For additional information about Finney Company, visit www.finneyco.com or call (952) 469-6699.